Using an electric mixer, beat the butter and sugar until pale and creamy. Add the vanilla and beat for 1 minute. Add eggs, one at a time, beating well between each addition (the mixture will look curdled at this stage). Add the flour and milk, in alternate batches. Continue mixing for another 2 minutes. Stir in the lemon essence with a wooden spoon until just combined. Spoon mixture evenly among the lined pans and smooth the surface. Bake in preheated oven for 20-25 minutes or until a skewer inserted into the center comes out clean. Remove from oven and transfer to a wire rack to cool completely. Use an apple corer to cut a small hole out of the top of each cake (you can use a small knife if you don’t have an apple corer). Use a teaspoon and place the lemon curd evenly among cupcakes. Place egg whites, cream of tartar and vanilla in a clean, dry bowl. Use an electric mixer to whisk until stiff peaks form. Gradually add the sugar, beating well between each addition. Continue beating for 2-3 minutes or until sugar completely dissolves. Place meringue in a piping bag fitted with your favorite nozzle. Pipe onto the cakes. Use a blowtorch to cook the meringue until lightly golden. 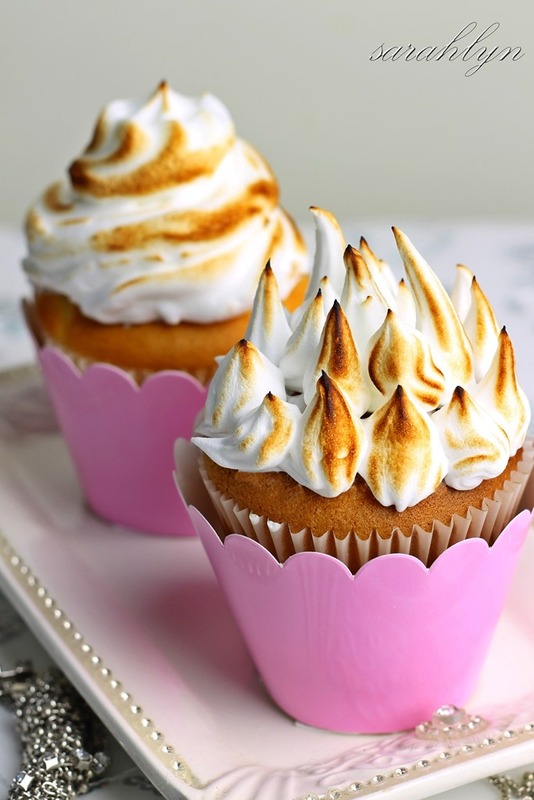 Alternatively, preheat the oven to 200°C and bake the cupcakes for 3-5 minutes until meringue is golden. * You can use store bought lemon curd for this recipe.